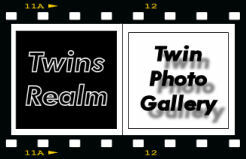 Welcome to our fabulous twinny site. We hope you enjoy all we have to offer. Have you got questions about raising twins and multiples? Check out our Parents Page for help and lots of useful contacts. Check out this wonderful selection of books for and about twins!Our Twin Books and more area now has over 600 hand selected twinny items to choose from. Twin troubles are a part of twin life; we don't like to talk about it but it's true! Life brings many challenges; shockingly for us this included a breakdown of our twinny relationship which resulted in us being estranged for many years. This experience was painful and difficult for both of us. The world's first dating site exclusively for twins to meet other twins. I've been diagnosed with CFS/ME and a number of auto-immune conditions. My symptoms mean I struggle to have enough physical strength for everyday living. Thankfully the science in these areas is progressing and treatments will hopefully be available soon. For more detailed information see my health page. I've been overseas, mostly staying in India and Sri Lanka for many years. You can see some pics from my journeys on my Overseas Travels Pages. I've also taken over responsibility for maintaining our Twins Realm site. Unfortunately because I've been having severe health problems the last few years this has meant some really long delays. I apologise for the unavoidable delays in site updates and really appreciate all your patience and understanding. All the twin photos being sent in are fabulous - I will try to get them online as soon as I can. Please keep emailing us your photos, suggestions and comments. For more information about Lake and Flame check out About Us.